The Mariner of the Seas will provide you with one of the most exciting cruise experiences as you sail to East and Southeast Asia. 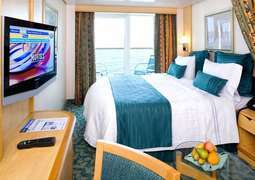 The Mariner of the Seas is the perfect ship to give every guest the cruise holiday they are looking for. The stylish cabins available on board will provide you with a comfortable and relaxing place to rest after the day’s adventures. The ‘Vitality Spa’ will help you unwind, with over a hundred treatments available including massages and acupuncture. If you would prefer some retail therapy, boutiques such as ‘Coach’, ‘Guess’ and ’Tiffany & Co.’ offer prices land can’t match and superb service from specialists. On the Mariner of the Seas you can use the ship’s digital ‘WayFinders’ to find all of the best spots on board and you might find your way to the ‘Wig & Gavel’, a British pub, or ‘Boleros’, a Latin-themed lounge. Feel like some home comfort food? Head to ‘Johnny Rocket’s’ for a burger or onion rings, or enjoy complimentary fine dining in the main dining room. The Mariner of the Seas will keep you entertained into the night with Broadway shows and the Vegas-style ‘Casino Royale’ is the perfect chance to test your luck with roulette, blackjack and more. 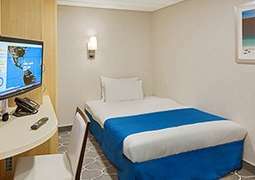 Newly refurbished in 2018, there are heaps of beautiful cabins onboard the Mariner of the Seas for you to choose from. You are bound to feel your best on board the Mariner of the Seas. Feel free to choose from comfortable Inside, Outside and Balcony cabins, or from a variety of luxurious Suites it’s up to you to decide which cabin best fits your needs and desires. 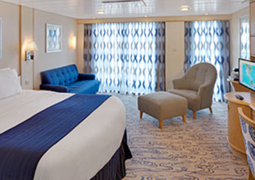 Each stateroom offers a blend of comfort, style and value each designed to meet your needs perfectly. 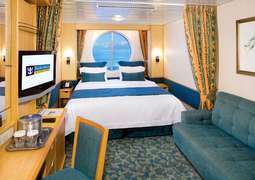 Mariner of the Seas offers 26 wheelchair accessible cabins. Mariner of the Seas offers diverse and delicious dishes at sea. Delight in Italian delicacies in 'Portofino', fresh steaks at the 'Chops Grille', American classics at the retro 'Johnny Rockets' diner and delectable ice cream at 'Ben & Jerry’s' ice cream parlor the list is endless.In case you don’t feel like eating in a restaurant, feel free to order warm and cold dishes to enjoy in the comfort of your cabin via cabin service, available between 5.00am and 12.00pm each day. If you get hungry while going for a walk give the new 'Free Boardwalk Dog House' a go with hot dogs and much more! 'The Vintages' wine bar offers a long list of specially selected wines to sample and enjoy, along with the 'Latin American Boleros Lounge' with its electric atmosphere and numerous other bars and cafés are also available with delicious coffee and cocktails. New additions include the delicious 'The Bamboo Room', 'Izumi Hibachi & Sushi', 'Playmakers' Sports Bar & Arcade and 'Sugar Beach' candy shop. Relax and tank up on energy in the Day Spa with a range of different treatments and enjoy a swim in one of the 4 pools on board including a solarium pool are for adults only. Power up as you please with the modern exercise machines in the fitness area, along with the extensive range of classes on board from yoga to tai chi. 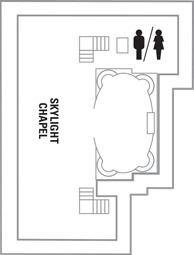 The wellness and fitness offerings on board are endless. A variety of shops on board the Mariner of the Seas leave no wish unfulfilled, offering cosmetics, clothing and much more.